← An Ode to Little Busters! Magi is a funny series for me. For whatever reason, it is a great anime for shipping. Possibly this has something to do with the huge mixed gender cast and how everyone gets a chance to interact with each other in ways I would consider pretty endearing and heartwarming. I’m ridiculously attached to all the characters, although I think the overall plot lacks thematic focus. I’ve liked this second season a lot so far because the characters are given the chance to loosen up, although it doesn’t seem like the fun times will last forever what with the main crew splitting up. But with the recent attention being given to the Hakuryuu x Morgiana pairing, I thought now would be a good time as any to pitch in with my thoughts. They have a few of the qualities I look for in a couple. The most important aspect being that their relationship isn’t purely romantic. They have a basis of friendship and mutual care for each other. Hmm, perhaps. I think their relationship really plays with this idea of inequality, seeing as on the surface, Morgiana is a slave and it is Alibaba, the prince, who rescues her. But instead of romancing her, Alibaba befriends her and treats her like she’s equal. On top of that, he is clumsy and dense, rather than dashing and romantic. Not to mention that physically speaking, Morgiana is stronger than him. It’s seemingly an inversion of the prince x commoner dynamic that we see in classic romantic fairytales, but it plays the core idea of it – a nice guy who sweeps you off your feet with kindness – very straight indeed. So on that level, the relationship really works. I do prefer Morgiana’s relationship with Hakuryuu, though, but this could simply come down to me preferring Hakuryuu as a character. Actually, when you think about it, Hakuryuu is more of an “ideal prince” than Alibaba is seeing as he is quite the gentleman. But he’s also deeply insecure and prone to negativity. I wouldn’t say this is a “deconstruction” or whatever, but for me, at least, Hakuryuu is definitely the more interesting portrayal of the not-so-princely prince! More so than Alibaba and Morgiana’s relationship, Hakuryuu’s advances on Morgiana feel like a traditional courtship. He treats her like a lady and is visibly affected by her presence. He’s outwardly protective her and his respect for her is evident in how deeply he seems to consider her opinions. There’s something dogged and earnest about Hakuryuu which I can’t help but get behind. This is a long, roundabout way of saying that I think Hakuryuu would make a better boyfriend than Alibaba. I don’t deny Alibaba is an excellent friend, though. I can’t help but think that Morgiana is mistaking her deep gratitude for love because Alibaba is literally the first person to extend a welcoming hand to her. I suppose her own feeling of self-loathing about her slave roots prevents her from making much of a move on anybody. They are fully honest with each other (Alibaba never comments on Mor’s “flat chest” and Mor never says anything like “B-Baka, it’s not like I like you or anything!”) and that’s why they’re refreshing in a way. Episode 18 of Magi’s first season (or chapter 81 in the manga) illustrates this point well and it probably contains the exact moments where moderate AliMor shippers became hard-core shippers willing to sink with the ship. Both Aladdin and Ali find her dancing to be very beautiful but Ali is the one who shouts “You look really beautiful Morgiana!” and she notices his voice out of the crowd and then smiles. And her smile probably was the most beautiful thing in the anime that sold this ship. Alibaba ruins this moment straight afterwards by complimenting all the other girls, which made me laugh but also affirmed to me that this ship is in a rut and will never go anywhere in a hurry. … Well, there is development in the manga. Chapter 199 is probably the most epic rickrolling I’ve ever seen directed towards a ship. Being an Alibaba x Morgiana fan is worth it, just for that. I won’t spoil it for those who haven’t read the manga, but it’s pretty good stuff, on the whole. Especially the followup chapter. Now that’s how you use shipping to make a great joke. They’re both pretty good pairings. My personal biases lead me to favour Hakuryuu over Alibaba, but I think both pairings make good cases for themselves. That all being said, my OTP is Myself x Morgiana. I guess this was a pointless discussion. Oh well, this was still fun to write. 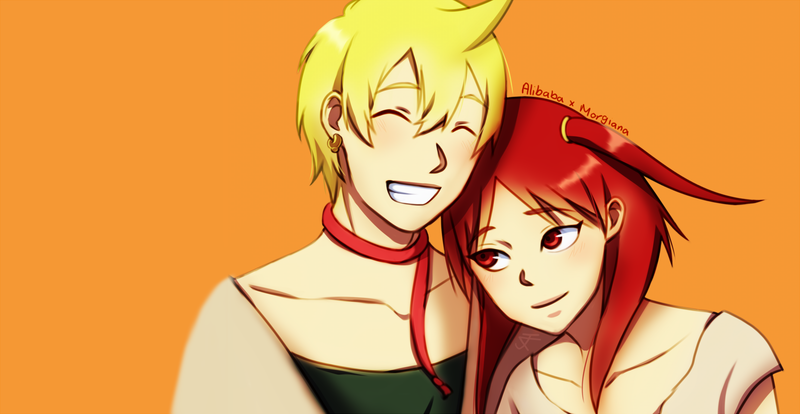 Who do you ship in Magi? Posted on October 22, 2013, in Pairings and Shipping and tagged alibabaxmorgiana, bland male MCs are actually interesting, hakuryuuxmorgiana, i just want to squish these people, magi, my pink-haired waifu, shameless fanboying, yuki kaji hurts my ears. Bookmark the permalink. 24 Comments. I don’t really have any Magi ships – the romance in general doesn’t really float my boat – but I could happily get behind the Hakuryuu/Morgiana piairing if it ever actually eventuated. But I’m biased, because Alibaba mostly just annoys me these days while I see Hakuryuu as a far, far more interesting character. 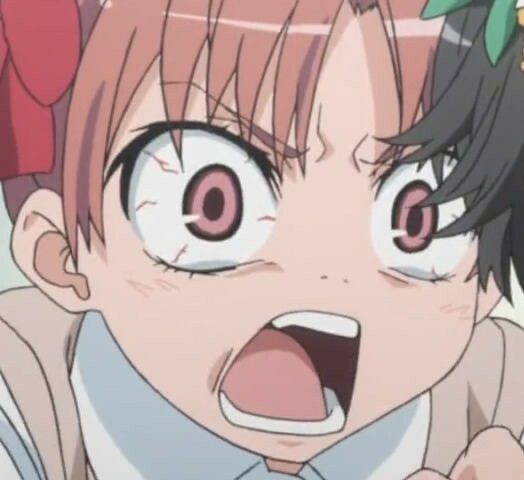 Perhaps if Alibaba wasn’t cursed with an annoying voice actor, it would be easier to get behind him, huh? Either way, he’s a pretty typical protag. I didn’t mind him in the first half of season one of the anime, but the second half felt like one long Alibaba angst-fest, and I got bored of him pretty quickly. Now that season two is here, I find I just don’t care about his character at all, and so I consequently become annoyed at how much screen time he gets. Maybe I should try reading Magi. I’m still afraid of finishing the first season due to the anime original ending (is that right? ), but I like Hakuryuu more than Alibaba… or at least, the former is the more interesting character. There were anime original elements in the ending of the first season, but it actually did follow the manga, only at a ridiculously accelerated pace. I’d honestly forgotten everything that had happened in the anime by the time the new season started, but I didn’t have too much of a problem following it. I’m glad to hear that you like the fanart! Oh. So THAT’s how it’s going to be, is it? It seems we must fight to the death to claim her as our waifu. I propose a battle: Karaoke, perhaps? Well, at least you’ve encouraged me to get up to date on Magi. …Though I already claimed her first on the waifu chart, so I feel that I should get some kind of advantage here. I may not be the most organised person, but at least I’ve got my priorities straight: Morgiana first, fair competition second. Excuse me? I understand not liking a particular character, but insulting the viewers is outrageous. I like Kougyoku. Problem? I wonder why this comment hasn’t been moderated already… FROGGY, WHERE U GO AT THE IMPORTANT-EST OF TIMES? Sorry if I sound rude. I don’t mean to, but I find it intolerable when people insult the fans. As a matter of fact, I’m quite a fan of Kougyoku myself, although I accept my fate as a shiteshipper. Not that I approve of the anon’s comment as it clearly does not apply to everyone else. Or, at the very least, I cannot see any causal link between liking Kougyoku and being a shiteshipper. 1. Alibaba, Aladdin and Morgianna are both main characters. 2. I hate Hakuryuu and he kissed Morg without her permission –> he’s not a gentleman. Alibaba and Morgianna have so much hints from the beginning, Hakuryuu and Morgianna barely have any hints, if it does, it’s just from Haku, which is one-sided, so nah. 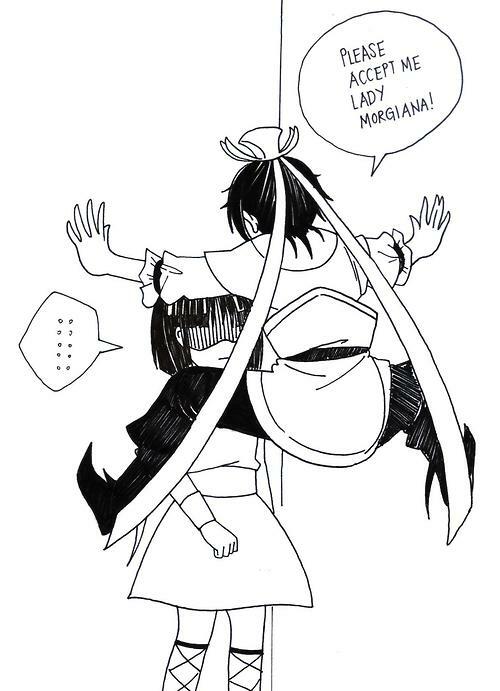 So yeah, I don’t understand people who ship Hakuryuu and Morgianna. hakuryuu x morgiana and alibaba x kougyoku are best couples. alibaba x morgiana is too dysfunctional, she treat him like master and author say they cannot even talk without aladdin there. bad couple. i am glad hakuryuu is back to normal and not evil anymore. he is much better for morgiana than alibaba. and kougyoku and alibaba get along in ways morgiana cannot understand. i think that they are best together and should finally get married. People say they’re the cliche main guy x main girl ship but uh hello? Aladdin’s the main guy :P Not Alibaba. HakuMor and AliKou are my biggest NOTP in Magi. Personally, I think Hakuryuu’s better off alone or Ohtaka should give him a love interest, NOT Morgiana. I just hate HakuMor and AliKou to bits. I hate Hakuryuu for being such a jerk, he’s twisted as sh*t and that time when he stole a kiss from Mor is just disgusting and rude. It’s NOT cute at all. I used to love Hakuryuu a lot but—-ugh. Alibaba & Kougyoku are obviously friends and both of them mentioned a lot of times that they’re FRIENDS. Kougyoku’s better off with Judal-chan.